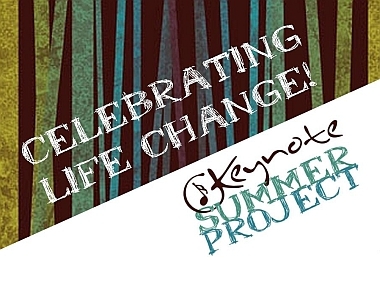 25 students participated in the Keynote Summer Project. 13 students participated in the Impact Music Project. Those 38 students formed six bands that logged slightly over 20,000 road miles. Those six bands performed 79 concert events. Over 9000 people heard the gospel through their concerts. 759 of those people said that they were interested in having further conversations about spiritual things. 1048 of those people indicated that they had decided to begin a relationship with God through Jesus Christ! Praise God for what He has done! And please pray that those who trusted Christ will grow in their new relationship with Him, and that those interested in further conversation will eventually place their faith in Christ. One student truly was terrified to speak publicly. In fact, she had never spoken in public since being humiliated by a teacher in third grade. To face a room of 40 people and tell her story of fear took the love and power of God. Upon her tearful and triumphant conclusion she received a rousing standing ovation! On August 19 & 20 three Keynote staff members will train students from several campuses in St. Louis, MO, in communication skills related to their weekly meetings: program planning, being an emcee, and worship leading. Five more Keynote trainers will conduct communication training in Hungary August 21-29. They will teach public speaking and worship leading to 20 hand-picked college and high school students. Thank you for helping to change lives through your partnership!